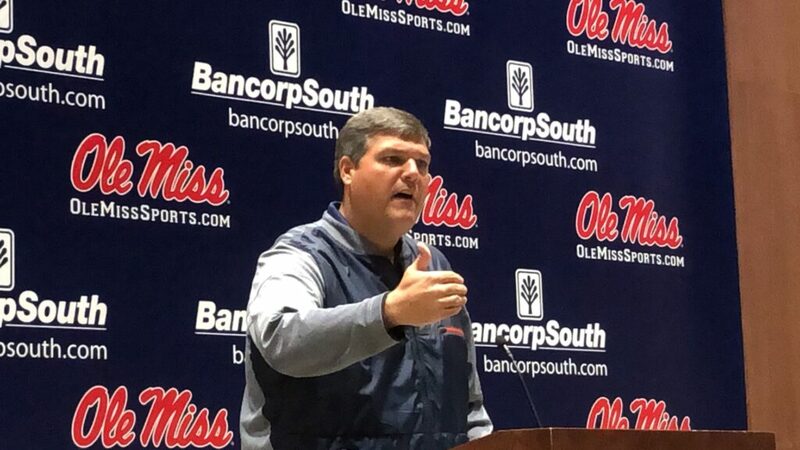 Ole Miss head coach Matt Luke addresses the media. Photo by Adam Brown. The Ole Miss Rebels look to finish out the last 10 days of the 2018 football season on a strong note with two wins. The team’s next stop before the Egg Bowl at home is to Music City to face the Vanderbilt Commodores Nov. 17. Head coach Matt Luke discussed in his weekly press conference on Monday how pleased he was with how the team battled through adversity after losing to Texas A&M 38-24. “We are going to pour everything into these last 10 days and keep these guys fighting,” Luke said. The Rebels battled yet another road injury when junior running back Scottie Phillips went down on the first play of the second series with a sprained ankle. Luke praised the Commodores’ offense and said Vanderbilt is a “very tough” place to play football. “The main thing is that we have 10 days together. Let’s go finish this thing the right way,” Luke said. Looking forward to this disaster being over.